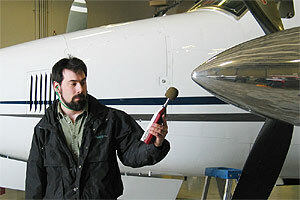 Noise monitoring is an integral part of every effective hearing conservation program. Accurate measurements of employee noise exposures will determine if a program is needed, and if so, who must participate. In addition, noise level data is required to establish adequacy and appropriateness of hearing protectors as well as to identify areas which would require high noise warning signs. We provide several types of noise level measurement. The type of measurement that is best for you will depend upon the work environments and processes specific to your company as well as upon the reasons for which you are requesting the survey. This method can provide an accurate estimate of noise exposure for individuals whose noise levels do not vary. Regulations, as well as best practices, require "representative" monitoring of employee noise exposures. When employee noise levels vary (ie, employees move in and out of noise and/or noise levels fluctuate), dosimetry may be the only means to obtain a representative sample.